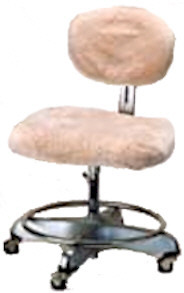 Other available office chair seat covers The Steno Sheepskin Chair Cover is a shower cap style cover that wraps around underneath w/ elastic bound edges for both the seat & backrest. You will be asked for your seat and backrest measurements upon clicking the add to cart button. If your seat (pun intended) is killing you, these will make a huge difference! These are made to order, so allow a week or two for production. Gobi, Camel, Pearl, Silver, Blue Burgundy, Charcoal, Black, Dark Silver, Brown and Mushroom.